Tucked in the hill country just south of the Tennessee state line is an extraordinary archeological site. A simple rock shelter, little larger than a baseball diamond, is home to one of the most complete records of prehistoric cultures in the Southeast. At Russell Cave National Monument, you can tour this cave shelter where ancient people of the Southeast lived for more than 10,000 years. 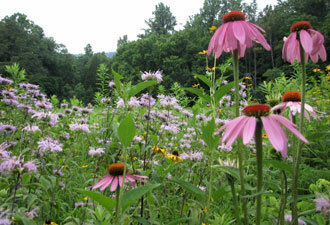 Visitors will find interesting activities here in any season. You can participate in the park's prehistoric tools and weapons demonstrations, watch the park film, explore the museum, hike the mountain trails, or go birding. 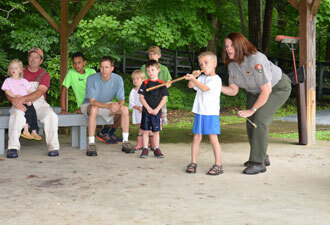 Kids can earn a Russell Cave badge by taking part in the Junior Ranger program. In 2013, a number of special events are scheduled to commemorate the 175th anniversary of the Trail of Tears. The local community knew about Russell Cave long before the Nation took notice. As prior landowners, the Russell and Ridley families plowed the dark fertile soil along the creek bed, uncovering ancient arrowheads and spear points. Sweethearts and church groups picnicked amongst the boulders and bones in the cave shelter. One early 20th century photograph shows a dance that took place with fiddle playing and the whooshing water of the creek as the soundtrack. When the Tennessee Archeological Society discovered Russell Cave in 1953, it was no surprise here, but it sent shock waves throughout the archeological community. In an area no bigger than a movie theater, this “ladder in time,” as archeologist Carl Miller described it, revealed an unbroken record of 10,000 years of human habitation. Russell Cave had finally arrived. The Smithsonian Institute and the National Geographic Society sponsored digs throughout the 1950s. Using the latest technology, such as Carbon-14 dating, researchers determined the ages of ancient artifacts. Archeologists marveled at fishhooks and spear points that had never before been seen anywhere in the country. They knew that Russell Cave was extraordinary. To preserve and protect this special place, the National Geographic Society purchased 310 acres of land from the Ridley family, gifting it to the American people in 1958. 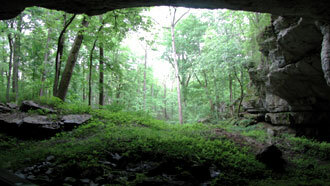 In 1961, President John F. Kennedy proclaimed Russell Cave a national monument to be administered by the National Park Service. Some visitors find that leaving Russell Cave is difficult. You get lost in the seductive solitude while walking among species of plants and trees that were here when mastodons ruled. You hear the sounds of animals that never left. Just beyond the giant blue ash tree, the yawning mouths of the cave and cave shelter stand ready to tell more about the distant past. Russell Cave National Monument may be low on visitation, but it's high on inspiration. Revel in the mysteries of an ancient way of life when you visit.